This comprehensive text is a major synthesis on ecological change in the Gulf of Alaska. It encompasses the structural and annual changes, forces of change, long-ecological changes in the atmosphere and ocean, plankton, fish, birds and mammals, and the effects of the 1989 Exxon Valdez Oil Spill. 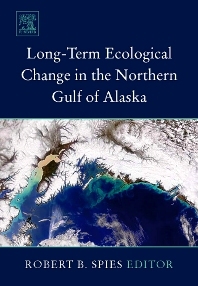 With 5 major sections, Long-term Ecological Change in the Northern Gulf of Alaska first describes the physical features, the atmosphere and physical oceanography, the annual production cycle, the forage base for higher animals and trophic transfer, and the adaptations for survival in this changing environment for 9 portal species. Then, the major forces of change are introduced: climate, geophysics, fisheries and harvesting, species interactions, disease and contaminants. Next, the long-term records of change in physical factors and biological populations are presented, as well as the potential reasons for the biological changes. Following is the history of the Exxon Valdez oil spill and its long-term effects. And, finally, the emergent properties of the ecosystem are discussed and an attempt is made to weigh the importance of the major forcing factors in terms of their temporal and spatial scales of influence. I. Introduction (R. Spies, T. Cooney). B. The physical environment of the Gulf of Alaska (T. Weingartner). C. The marine production cycle (T. Cooney). D. The transfer of matter and energy through the food web (T. Cooney). b. Pink salmon (T. Cooney). 3. Seabirds (M. Benowitz-Fredericks, A.S. Kitaysky, A.M. Springer). 4. Marine mammals (S.J. Iverson, A.M. Springer). 5. Crabs and shrimp (G. Kruse). D. Species interactions (G. Kruse). E. Marine mammal harvest and fishing (G. Kruse, A.M. Springer). G. Contaminants (R. Spies, S. Rice). IV. Long-term change in the northern Gulf of Alaska. A. Introduction (R. Spies, T. Weingartner). B. Atmosphere and ocean (T. Weingartner). D. History and production trends in salmon (T. Cooney). E. Pacific herring (E. Brown). F. Groundfish (W. Boeing, M.H. Martin, J.T. Duffy-Anderson). H. Seabirds in Cook Inlet (J.F. Piatt, A.M.A. Harding). I. Marine mammals (A.M. Springer, S.J. Iverson, J.L. Bodkin). J. Crabs and shrimp (G. Kruse). V. The Exxon Valdez Oil Spill (S. Rice, J.W. Short, M.G, Carls, A. Moles, R. Spies). VI. Long-term changes in the Gulf of Alaska: Properties and causes (R. Spies, T. Cooney, A.M. Springer, T. Weingartner, G. Kruse).